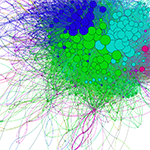 One of the focuses of the Trails lab is visualizing social media data for human consumption. The massive amounts of data generated during events or through trending topics are too large to be easily navigated or consumed by a human, so we turn to visualizations to order the data in some comprehensible form. The following are graphs of networks from various events and topics on Twitter. Nodes in these graphs may represent Twitter accounts, tweets or hashtags, and edges co-occurences or manual connections made by users. The thumbnail images link to interactive version of the visualizations. 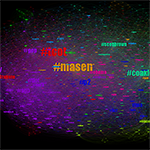 A graph of the co-occurencce of the 1,500 most used hashtags in the masen2010 dataset. The nodes represent the hashtags, and edges between the nodes represent the two hashtags being used together in a tweet. A graph of the friendship network of the 500 most vocal users in the masen2010 dataset. The nodes represent the vocal users, and edges a mutual following relationship between the nodes. The colors on the graph represent the three detected modularity classes, one of which is made up of a small group of liberal accounts, while the other two are conservative accounts. A graph of the retweeting network of the 500 most vocal users in the masen2010 dataset. The nodes represent the vocal users, and an edge between User A and User B represents User A retweeting User B. 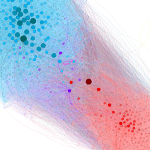 The colors on the graph represent the detected communities, one of which is made up of a small group of liberal accounts, while their are six among the conservative accounts. A graph showing the retweeting spread of the most retweeted tweets in the 2010 dataset. 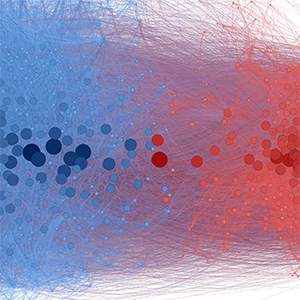 The nodes represent tweets, and are colored by the political orientation of the tweeting account (red for conservative, blue for liberal, grey for neutral). 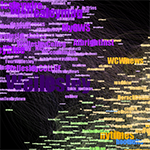 The edge color represents whether a tweet was unmodified (green), modified by adding hashtags or mentioning users (orange) or modified (purple). A graph showing the co-retweeting patterns of the 1,500 most retweeted users in the 2012 Massachusetts Senate Election dataset. 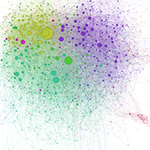 Two users are connected in the graph if they have both been retweeted by another user. The colors in the graph represent the different communities. This graph visualizes the co-retweeting patterns during the 2013 State of the Union Address. Two accounts are co-retweeted when at least one user has retweeted both of them. 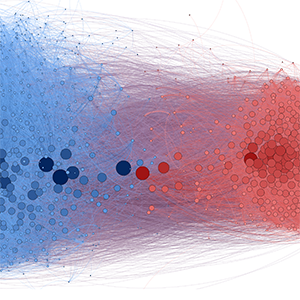 The nodes in the graph represent the top 1,500 most retweeted accounts during the debate, and the edges indicate that these two accounts have been co-retweeted. The edge weight is based on the number of users retweeting both nodes. The layout of the graph is based on Gephi's Force Atlas algorithm, in which two nodes are attracted to each other if they have an edge between them. The size and darkness of the node's color represent the calculated Eigenvector Centrality of that node, which ranks nodes by their influence in the network. 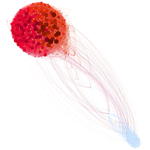 The colors of the nodes (red or blue) are based on the Modularity algorithm, which finds communities within the graph. Nodes in the same modularity group are more closely connected to each other than to other nodes in the network. On Feb 15th, 2012, the hashtag #ThoughtsInClass was trending in the US, of which we collected 90,000. The graph is of the co-retweeting behavior in the hashtag. 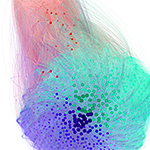 The nodes in the graph represent the top 1,500 most retweeted accountsfrom the hashtag, and the edges indicate that these two accounts have been co-retweeted. The edge weight is based on the number of users retweeting both nodes. The layout of the graph is based on Gephi's Force Atlas algorithm, in which two nodes are attracted to each other if they have an edge between them. The size and darkness of the node's color represent the calculated Eigenvector Centrality of that node, which ranks nodes by their influence in the network. The colors of the nodes (red or blue) are based on the Modularity algorithm, which finds communities within the graph. Nodes in the same modularity group are more closely connected to each other than to other nodes in the network. This graph is based on a dataset of tweets collected on Valentines Day 2013, containing the words "valetine","v day" or "vday". The dataset contains roughly one million tweets The graph is of the co-retweeting behavior among the top 1,500 retweeted users in the hashtag. The edges indicate that these two accounts have been co-retweeted. The edge weight is based on the number of users retweeting both nodes. The layout of the graph is based on Gephi's Force Atlas algorithm, in which two nodes are attracted to each other if they have an edge between them. The size and darkness of the node's color represent the calculated Eigenvector Centrality of that node, which ranks nodes by their influence in the network. 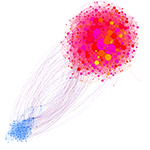 The colors of the nodes (red or blue) are based on the Modularity algorithm, which finds communities within the graph. Nodes in the same modularity group are more closely connected to each other than to other nodes in the network. Graph of the Wellesley College friendship network. 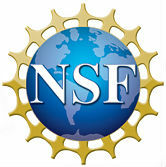 There are four different communities detected by the modularity algoritm: The purple group contains official college accounts and professors from Wellesley, the two green and orange groups contain celebrity and news accounts, the green predominantly local and the orange national, and the blue group other colleges and education related accounts.